The Street Basketball Association represented themselves well during the NFL Super Bowl festivities as some of our showcase players participated in the Gridiron Celebrity Hoops Game in San Diego. Earl "Pep" Tyson" (Harlem World), Hugh "Baby Shaq" Jones, and Pat Da-Roc demonstrated the SBA's electric style of basketball as they left the audience in awe with their jaw dropping, gravity defining display of skills and ball handling wizardry. The players gave the fans just a taste of what is to come from the SBA during its upcoming tour. 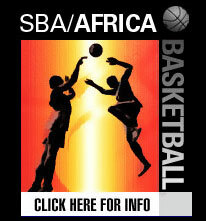 For more information visit www.streetbasketassociation.net. "We Got Our 5...Get Yours"
The Super Bowl Gridiron Celebrity Hoops Game in San Diego featured many NFL players including Terrell Owens (San Francisco 49ers), LaDainian Tomlinson (San Diego Chargers), Marcellus Wiley (San Diego Chargers), R.W. McQuarters (Chicago Bears), and Peter Warrick. The Game Day Gridiron Celebrity Hoops event is the only officially sanctioned celebrity basketball game at Super Bowl XXXVII and has been an official activity of Super Bowl since Super Bowl XXXIII. Game Day Gridiron Celebrity Hoops offers football fans of all ages a lifetime experience to watch their favorite sports heroes and Hollywood "stars" play in a competitive game of basketball. Game Day Gridiron Celebrity Hoops' Youth Commissioner Bow Wow (Multi-platinum music recording artist/ actor, Like Mike) Nick Cannon (Drumline, The Nick Cannon Show), displayed their basketball skills and entertained their enthusiastic fans. 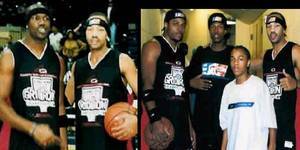 Bow Wow and Nick Cannon spent most of the pre-game warm-ups learning the latest street ball moves and tricks from Harlem World and Pat Da Roc, while Baby Shaq and Terrell Owens were comparing on who had a higher vertical. Every year, Game Day Gridiron Celebrity Hoops attracts local, national and international media and will once again be featured as part of NFL Films. A percentage of the proceeds from the popular game, benefit the Junior Achievers Motivated to Succeed (JAMS) Foundation. The JAMS Foundation's mission is to enrich the quality of life of today's abused and neglected youths placed in the foster care system. This year the JAMS Foundation has selected two San Diego charities that champion that cause; The Polinsky Children's Center and the San Pasqual Academy. These two noteworthy charities will benefit from the event proceeds. In addition hundreds of these important and special kids will be able to attend the hoops challenge through the generosity of others.